A crash with a tractor-trailer or other large truck is every driver’s worst nightmare. Especially if you are in a smaller vehicle, the result of an accident with an 18-wheeler may be catastrophic. Truck accidents occur all too frequently in Charlotte and the Carolinas. Mecklenburg County is a hub for transportation companies with I-77 and I-85 serving as major trucking routes. When trucks and tractor-trailers operate at high speeds on congested roadways alongside commuters, accidents happen. $4.5 Million Settlement for client whose wife and unborn child died when their vehicle was hit head on by a dump truck that negligently crossed the centerline of the roadway. $2.2 Million Settlement for clients injured in a collision with a dump truck that turned in front of clients’ vehicle. The trucking company was sued for, among other things, negligent hiring and retention of the dump truck driver. $1.6 Million Settlement for client who sustained a severe hip injury in a head-on collision with a tractor-trailer. Inadequate licensing and training of the driver. Lack of oversight and supervision of the driver. Failure to ensure that cargo is properly loaded and secured. Improper maintenance and repair of the commercial motor vehicle. Drunk driving. The FMCSA reports that there were 4,152 people killed in alcohol-related traffic fatalities in 2016. Distracted driving. About 6% of large truck crashes involved driver distraction as a factor, of which 16% was related to cell phone use. All these issues are preventable. Unfortunately, many trucking companies skip important safety training and vehicle inspections simply to save time or money. Maintaining vehicle maintenance and drivers’ certifications is the responsibility of the trucking company. Those companies that fall short in safety standards or training may be legally liable for accidents that occur. An experienced trucking accident lawyer at Warren & Kallianos can help you hold them accountable. Because of the danger of operating commercial motor vehicles, both state and federal laws set standards and requirements relating to their operation. 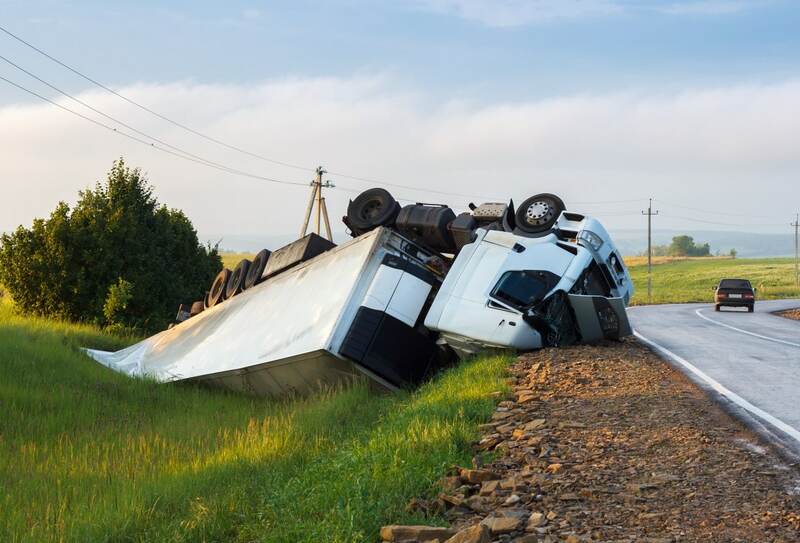 In many instances, accidents can be linked to the failure of the driver and/or the trucking company to comply with applicable laws and regulations. Most truckers are under extreme pressure from their employers and shippers to deliver loads on time. They also face economic pressure to get in as many miles as possible, because most drivers are paid by the mile not by the hour. This can lead to many dangerous practices such as speeding, reckless driving, driving while overly tired, and abuse of legal or illicit drugs to stay awake. How Do Drowsy Truck Drivers Affect Highway Safety? The Federal Motor Carrier Safety Administration (FMCSA) has Hours of Service (HOS) regulations which govern how many hours commercial truck drivers can drive a truck before they must stop and take a break and stop to sleep. The hours of service regulations were enacted to help protect the public from the hazards of truck accidents caused by drowsy truck drivers. In the past, commercial truck drivers kept paper logs, which put them on the honor system. Now the FMCSA has mandated electronic logging devices (ELDs) which connect to the truck’s engine to automatically log how long they have been driving and how long they rested. Your Charlotte trucking accident attorney will check to make sure that the truck driver who caused your accident was not violating the HOS regulations at the time of the crash. Interstate trucking companies and commercial truck drivers are required to carry higher amounts of insurance than automobile owners because of the significant harm large trucks can cause. The settlements may be larger because of the severity of the injuries. A few of the factors that can influence the value of your case are the severity of your injuries, who was at fault, and the amount of insurance available to provide compensation. We can offer an assessment of what your case might be worth after a free review of the details of your accident. If you feel like you have a valid injury claim, do not hesitate to contact our trucking accident lawyers. Medical costs related to the accident, including the cost of rehabilitation and future medical care. Lost earnings due to injuries sustained in the crash. Reduced future earnings due to ongoing impairments or an inability to return to work. Vehicle repair or replacement, including the cost of a rental car while your vehicle is being repaired. Punitive damages in exceptional cases. Fatalities are a tragic result of many truck accidents. In these situations, the surviving relatives may be entitled to bring a wrongful death action to recover money to pay for funeral and burial costs, medical bills, lost earnings of the love one, pain and suffering, loss of companionship, and other losses. Higher Stakes: Crashes that involve an 18-wheeler or other heavy commercial vehicle frequently cause more serious injuries than those that involve only cars. Because of this, trucks typically carry insurance coverage with higher limits. This means that more money is on the line, and insurance companies want to pay out as little as possible. More parties involved: Truck accident claims often involve more than just the drivers who were in the crash. Examples of other potential defendants include the trucking company, the shipper, the company that owns the cargo, and the company responsible for repairing and maintaining the truck, among others. The tractor and the trailer may be owned or leased by different companies or individuals, each with their own insurance. The cargo may also be separately insured. Regulations: Truck drivers and the companies that employ them are more heavily regulated than other motorists. This makes it critical to work with a personal injury lawyer who understands trucking regulations and can look for violations that could establish liability. More data available: In many cases, there is more relevant data about trucking accidents that may be useful when bringing a claim – if the attorneys and investigators know where to look and what to do with the information. For example, many heavy trucks are equipped with data recorders like the “black boxes” that are so critical in airline crash investigations. These data recorders may contain important information about how the truck was being driven at the time of the crash. How fast was it going? Did the driver apply the brakes? Another potentially important source of information is the driver’s log. Truckers are required to log their time on the road to comply with hours of service regulations. The logs – and any discrepancies they may contain – could be evidence of driver fatigue, for example. As with other cases, accidents involving commercial motor vehicles require immediate investigation into the facts and circumstances of the accident as well as expert testimony to demonstrate how the accident occurred and the nature and extent of the injuries caused by the accident. The trucking company and its insurance carrier will have its investigators and attorneys working the case as soon as possible. Don’t wait to contact Warren & Kallianos. While you are recovering from your injuries, you may feel worried about paying your medical bills and taking care of your family. You need reliable guidance about your legal options. The Charlotte truck accident lawyers at Warren & Kallianos have the knowledge and resources to handle complex truck accident claims. With 58 years of combined legal experience, we have earned a reputation for securing large verdicts and truck accident settlements for victims in the Charlotte area and throughout North Carolina and South Carolina. You pay us nothing unless we win your case, so contact us today, or reach us through our website’s online contact form to get started. The Charlotte truck accident lawyers at Warren & Kallianos know the severe damage that a truck or tractor trailer accident can cause. As you struggle to recover from serious injuries, you may be feeling stressed, overwhelmed, and frustrated. That is why we want to assist you. We have handled many commercial motor vehicle cases and want to answer every question and concern you have about your case. If you have a claim, we have the resources and knowledge to fight for maximum compensation. Warren & Kallianos has the experience and resources to properly investigate and handle all types of commercial motor vehicle claims. If you have been injured in a trucking accident you may call 704-275-5593 or contact us to schedule a free and confidential consultation. Can Defective Truck Equipment Cause Accidents?